Delavan, WI -- Marvin J. 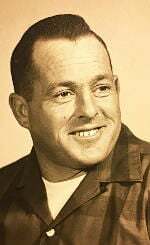 Boss, age 86, of Delavan passed away on Friday, April 12, 2019 at Mercy Hospital in Janesville. He was born in Lafayette Township, WI on May 28, 1932 to Frederick and Lucile (Mayhew) Boss. Marvin was united in marriage to Jeannette Graves on November 30, 1950 at the Brick Church in Walworth. He worked for many years as an operating engineer at B.R. Amon & Sons. Marvin is survived by his wife of 68 years, Jeannette; two sons, Daniel (Cindy) Boss, of Delavan, and Timothy (Sarah) Boss, of Elkhorn; grandchildren: Craig, Andrew, Chris, and Courtney; great grandson, Cooper Boss; step-grandson, Zachery Warner; step-granddaughter, Kaylee Mowery; a daughter-in-law, Kathy Boss, of Delavan; two brothers, Richard (Sandy) Boss, of Delavan, and Kenneth (Sandy) Boss, of Burlington. Marvin is preceded in death by a son, Wayne Boss; a daughter, Marion Boss; his parents; two sisters, Ruth and Leah; and seven brothers: Glenn, Clarence, Milton, Donald, Jim, Eugene, and Lawrence.